Despite customer outcry over Adobe’s switch from Creative Suite software in a box to Creative Cloud software as a service, the company reports that it added 221,000 paid Creative Cloud customers to its roster in the second quarter of 2013 for a total of 700,000 subscribers to date. That’s an increase over the 479,000 subscribers Adobe reported at the end of the first quarter. Those numbers, revealed as part of the company's second quarter earnings, are on track, and even ahead of Adobe's goal, according to Scott Morris, senior marketing director for Creative Cloud. "Going into Adobe Max we had a lot of momentum, and that continued and accelerated once we made our announcements," Morris told Macworld in an interview. "If you look at how far we’ve come in a pretty short period of time, and if you look at our own internal goals and how we’re achieving them, we are really, really happy with the way adoption has gone." According to Morris, customers who bought into the cloud subscription concept are committed, with 92 percent of them choosing a yearly subscription as opposed to a month-to-month—the better deal on the yearly subscription. Annual subscriptions cost $50 per month for individuals and $70 per month (per seat) for creative teams, though there are numerous discounts available for the first year. Month-to-month subscriptions cost more. "We’re really listening to those customers who are telling us they need something different, and we’re taking our time because we want to come up with the right solutions for those customers that will make them love Creative Cloud and get them excited about it the way that 700,000 people are so far," Morris said. 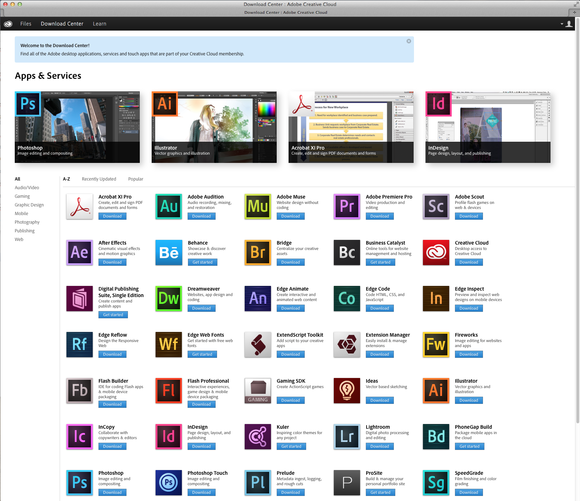 With Creative Cloud, Adobe is bringing in new customers, as some existing customers protest. Morris says Adobe is seeing small businesss who weren’t up for spending thousands of dollars on the Master Collection go for the option of $50 a month on their credit card. Morris says that is not true that Adobe is leaving unhappy customers that disagree with Creative Cloud in the dust. "We’re not giving up on the people who don’t like it. We’re not in the business of losing customers. We’re bringing in those new folks, but we don’t want to lose the customers that have been with us for a long time." From Adobe's standpoint, all Creative Cloud apps are compatible with CS6 or can export to CS6. Adobe considers CS6 a valid working product for years to come and the major non-cloud customer fallback position. "We were looking in terms of a couple of years out. We felt that if customers didn’t see Creative Cloud as right for them, then CS6 was the alternative. That's one of the reasons we left CS6 for sale and why we committed to updating it for the next major OS for Mac and Windows," said Morris. But Adobe customers seek a longer term solution for careers that have spanned some 20 years, and Morris says Adobe is now considering a more viable long-term approach. However, he says, that will take some time to figure out. For people who have hit lean times in the recession, Morris said they don’t have to upgrade right now, but when times improve, Creative Cloud will ease them back in the game for less upfront cost than in the past. Photographers are a special segment of Adobe's customer base, and one that tends to use fewer apps—typically just Photoshop and Lightroom—whereas other creatives, say graphic designers, tend to use a wider variety of programs. Adobe has not yet figured out a solution to meet the needs of all photographers. "For pro photographers who use Photoshop and Lightroom, but who also have a portfolio Website, Creative Cloud has a lot to offer them beyond just two desktop tools," Morris said. "There’s a bunch of other tools and services to help them manage their business, and a lot of photographers have come to Creative Cloud because of that." For others who use Lightroom and Photoshop exclusively, the question is what would make sense? "We’re thinking this through. Is it a bundle? Maybe. Is it something else? Possibly. We care a lot about photographers as a group, and there a lot of options for us to make an appealing offering for them." Though Adobe is concerned with its creative professional customers, it says the company may not be able to please everyone. "People who buy a single product and upgrade every three or four versions and who are really casual users—we may not have a solution for them. It may be that they go to a different Adobe product, or someone else's product," Morris said. Whatever happens, Morris said, Adobe will not change course or return to the old way of doing business. "We’re committed to the model and the path we’re on, but we are listening and flexible and open to tweaking things along the way to make it work for more people."